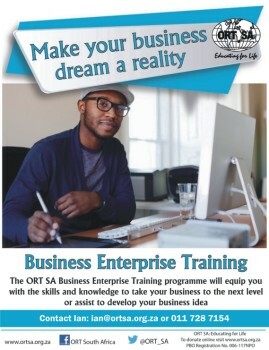 ORT SA’s innovative Skills & Enterprise Development Programmes enhance people’s future employment and business prospects by equipping them with proficiency in life skills, problem solving, cognitive skills, conflict management, computers, presentation techniques, financial management and business skills. 1.The New Venture Creation Qualification (NQF Level 2) provides learners with the entrepreneurial skills needed for enterprise development. ORT SA has recently been awarded provisional accreditation to deliver this qualification by the Services SETA. Training of Business Skills through the six modules of to the NVC Course NQF2 :Marketing, Financial Management, Operational Management, Customer Service and Business Ethics. To Inspire and empower unemployed young people with potential (i.e. those with a business idea or who have already started a business) to develop critical entrepreneurial skills to run a business. To skill unemployed youth with fundamentals skills and knowledge to finding employment and maintaining it. MICT SETA accredited for National Certificate: Information Technology: End User Computing NQF 3. BET participant and her mentor. 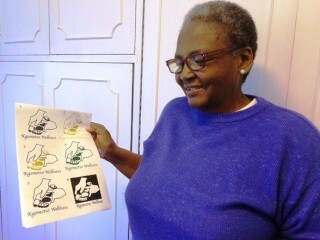 WHICH HAVE COMPLETED ONE OF THE ORT SA BUSINESS COURSES. DISCLAIMER: All information provided in official ORT SA websites and pages is provided for information purposes only and does not constitute a legal contract between ORT SA and any person or entity unless otherwise specified. Information on official ORT SA websites and pages is subject to change without prior notice. Although every reasonable effort is made to present current and accurate information, ORT SA makes no guarantees or warranties of any kind. ORT SA’s websites and pages may contain information that is created and maintained by a variety of sources both internal and external to the organisation. These sites and pages are unmoderated forums containing the personal opinions and other expressions of the persons who post the entries. caused or alleged to be caused by or in connection with the use of or reliance on any such content, goods, or services available on or through any such site or resource. Any links to external websites or pages and/or non-ORT SA information provided on ORT SA pages or returned from any web search engines are provided as a courtesy. They should not be construed as an endorsement by ORT SA of the content or views of the linked materials. In this disclaimer, any reference to “ORT SA” is deemed to be a reference to any associated entity, including, without any limitation, the ORT SOUTH AFRICA OPERATIONAL TRUST.